For a peppermint twist, substitute 1/4 teaspoon peppermint oil for the vanilla. 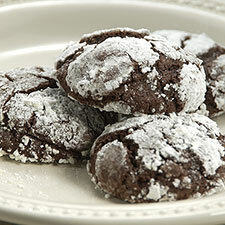 For a mocha crinkle, increase the espresso powder to 1 tablespoon or more, to taste. *We often call for our glazing sugar to be substituted for confectioners' sugar, as it's a "purer" sugar: it doesn't include cornstarch. However, in this case, go with confectioners' sugar; the cornstarch keeps the sugar from melting atop the cookies as they bake. Dough: Place the chocolate and butter in a small saucepan or microwave-safe bowl, and heat or microwave till the butter melts. Remove it from the heat, and stir until the chocolate melts and the mixture is smooth. In a separate bowl, beat together the sugar, eggs, vanilla and espresso powder. Stir in the chocolate mixture, baking powder and salt, then the flour. Chill the dough for 2 to 3 hours, or overnight; it'll firm up considerably. Baking: Place the coated dough balls on a lightly greased or parchment-lined cookie sheet, leaving about 1 1/2 inches between them. Bake the cookies in a preheated 325°F oven for 10 to 12 minutes, switching the position of the pans (top to bottom, and front to back) midway through the baking time. As the cookies bake, they'll flatten out and acquire their distinctive "streaked" appearance. Remove the cookies from the oven, and allow them to cool on a wire rack. Yield: about 5 dozen 2 1/2-inch cookies. Nutrition information per serving (2 cookies, 28g): 113 cal, 6g fat, 2g protein, 5g complex carbohydrates, 8g sugar, 30mg cholesterol, 33mg sodium, 38mg potassium, 38RE vitamin A, 1mg iron, 10mg calcium, 25mg phosphorus, 6mg caffeine.